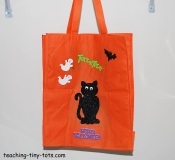 Toddler Activities: Have your child design her very own tote bag using foam stamps. 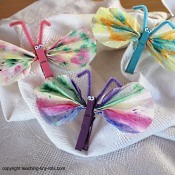 This also is a great birthday activity and each child can take home her goodies in his or her very own decorated bag. A great bag to carry that favorite toy or small book! Your child will be proud to carry his/her own personalized tote. Plate or newspaper to place stamps on. 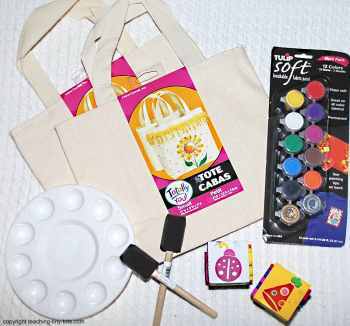 Discuss the colors to be used, stamp patterns, and how to apply paint with brush and where and how to stamp on bag. Put paint on palette. Have brush and water ready. Design one side of bag and let it dry. Complete other side of bag if desired. Hang to dry! Work one color at a time for very young stampers. 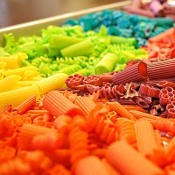 You may consider doing this in 2 sittings to avoid smearing and make the transition of colors easier. There are also colored totes that you can select from. 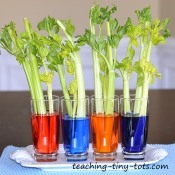 Great Party Activity! They sell these bags individually or in packs of 8-10 in various colors. Children can take their goodies home in their own handmade bag. Older children may want to embellish the top of the bag with trimming such as ribbon or yarn. These stamps make wonderful cards or even wrapping paper! 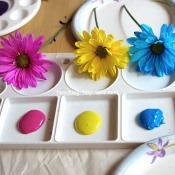 Use water colors or other paint or stamp pads for other variations. Create your own stamp using stick on foam stickers which they have a large variety of thems now available at craft stores. Use grocery reusable bags to print on and decorate with paint or foam stickers.